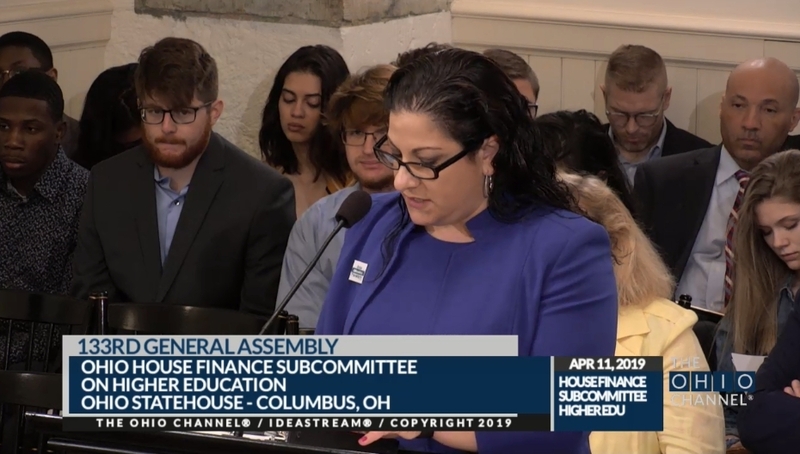 Michelle Francis, OLC’s Director of Government and Legal Services, testified on the state budget bill (HB 166) before the House Finance Subcommittee on Higher Education. OLC testified on HB 166, the biennial state budget bill, on Thurs., April 11 in front of the House Finance Subcommittee on Higher Education. Michelle Francis, OLC’s Director of Government and Legal Services, told lawmakers that state funding for Ohio’s public libraries has not increased with inflation or fully recovered from the recession. She also pointed out that since 2001, the Public Library Fund (PLF) has been cut by more than $113 million – a 23% reduction in funding. In Governor Mike DeWine’s state budget proposal released in March, he highlighted the work and importance of Ohio’s public libraries and kept the PLF at 1.68% of the General Revenue Fund (GRF). Francis explained that Ohio’s public libraries are simply looking for revenue stability in an effort to respond to the needs of Ohio’s citizens and the growing demand for services. She said that this is only possible with adequate funding. Francis urged members of the Ohio House to make public libraries a priority in the budget, to restore the PLF to 2008 levels of funding, and to hold public libraries harmless from any additional reductions in state funding. The testimony was covered live on the Ohio Channel and a video recording is available on the Ohio Channel website. A transcript of the testimony is also available on the OLC website.